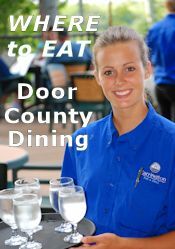 DoorCountyNavigator.com is one of our sister sites that offers a good jumping off point to investigate lodging, restaurants, galleries, activities, etc. This website provides in-person reviews done by the DoorCountyNavigator.com’s professional staff. Inns, B&Bs, resorts, campgrounds, restaurants, activities, real estate, shop and more are personally visited, so you can “Be in the Know – Before You Go”. In addition, you can view dozens of video tours of special Door County businesses, places of interest, nature and more!